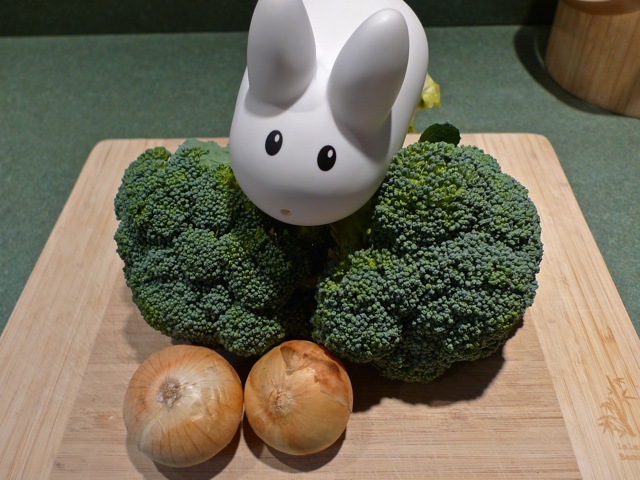 Amongst the many late summer veggies the labbits received this week from their CSA (Deep Meadow Farm in Ascutney, Vermont), the labbits got a share of broccoli, carrots, onions, leeks, and potatoes, and that means soup's on! As the days get shorter and the nights get longer, the labbits love cozying up to a bowl of hot soup. 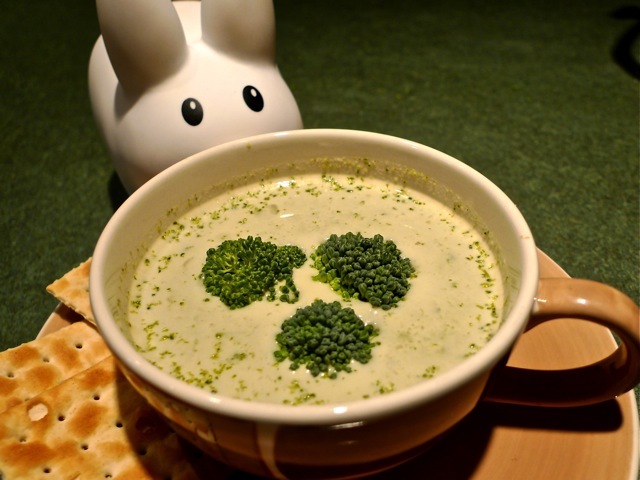 This broccoli soup is simple and quick to make. Serve it with crackers, or hearty bread and butter, and even some shaved Vermont cheddar cheese. Yum! The labbits declare this week Soup Week! Keep checking back this week to see two more soup recipes. For a printable version of this recipe, click here. All you need is some broccoli and some onion. The rest of the ingredients should be in the pantry! In a large pot over medium heat, saute the onions in butter until they turn translucent and are tender. Add in the chopped broccoli and saute for a minute. Add in the broth and bring to a boil. Reduce heat and allow the soup to simmer for about 10 minutes, or until the broccoli is tender. Remove from heat and allow to cool slightly. Using an immersion blender, puree the soup in the pot, or puree in a food processor in small batches, then transfer the soup back to the pot. In a small saucepan over low heat, warm the heavy cream, but do not bring to a boil. Whisk in the flour a little a Tbsp at a time. Stir cream into the pot of soup, and add salt and pepper to taste. Serve immediately with a garnish of small broccoli florets and shredded cheddar cheese. Add some bread and butter or crackers to the side. Enjoy! Serves: 4 - 6 labbits. Where'd You Get That Black and White Labbit?